Each year over 30,000 Illinois residents are released from the Illinois Department of Corrections, with nearly all returning to the same economically depressed communities in which they resided before their incarceration. Now over one million Illinoisans have some form of criminal record, which routinely interferes with one’s ability to take advantage of employment, housing and educational opportunities. That lack of access can create social and economic circumstances that result in illegal behavior. Consequently, nearly 50% of individuals released from Illinois Department of Corrections return to prison within three years, and fewer than 2% of the 425,000 individuals released between 1999 and 2015 have obtained and held a taxpaying job for two consecutive years after their release. Improving employment outcomes for people with criminal records through employment training and job assistance outside of prisons in the community is one of the most successful methods of improving the reentry of returning citizens to their communities and reducing recidivism. The overwhelming majority of people in prison will be released and will return to their communities. But the sad truth is that many of those individuals will end up back in prison. Roughly half of those released from an Illinois prison will return within three years. This is what happens when we do not prioritize rehabilitation and re-entry services. Too many formerly incarcerated people are returning to communities without restored social connections, economic opportunity, and access to affordable housing. Without that support, they are more likely to end up back in prison. Our state government should partner with communities to help people released from prison thrive. We need to build strong social connections and create economic opportunity in our communities and that can’t just start when people are released. It means rehabilitative services, job training, and re-entry services that begin in prison and extend after release. Expanding these programs in our prisons and in our communities will build that bridge between incarceration and re-entry. It will connect individuals to the social and economic opportunities they need to thrive and reduce recidivism. It’s a long-term investment in our state that will help lower future incarceration costs, which currently cost over $23,000 per inmate. 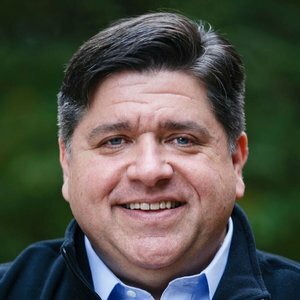 Let’s spend money educating instead of incarcerating Illinoisans. Connect people in prison early with evidence-based rehabilitative services including job training, education, mental health and substance abuse treatment. Encourage and facilitate positive relationships between people in prison, their families, and their communities to reduce the likelihood of recidivism after release. Create vibrant and thriving communities by investing in quality education, including preschool and quality childcare. Ensure community business owners and entrepreneurs have access to the capital, training, and mentorship they need to thrive. Reduce barriers to employment and expand community-based learning opportunities so people can build self-sufficient lives. Expand stable housing and healthcare in all of our communities. Help Illinoisans safely re-enter the workforce via a state re-entry employment program designed to place qualified people in state positions.